A new section of the Gloucester to Sharpness Canal - diverted to make way for a city bypass - has opened. The 300m channel has been designed to replace the old Two Mile Bend part of the canal, which is to be closed as part of the A40 south-west bypass. A group of schoolchildren dressed as pirates marked the channel's opening with a voyage on the King Arthur. 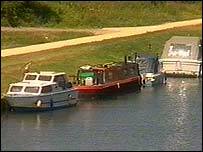 The next stage of the project will see a four-lane swing bridge built across the canal. It is due to open next year. When it is completed in April 2007, the £43m Gloucester south-west bypass will provide the city with a new link to the M5.